Have you tried the adult coloring book craze that's going on? I've always loved to color but felt silly coloring in a kid's coloring book, but the adult ones have so much detail and I find coloring in them to be really relaxing. I've tried all kinds of mediums, markers ( they seem to bleed through the paper a lot) crayons, and some colored pencils. I was given the opportunity to try out MLVOC 36 Color Pencil Set, and I'm really happy with them. 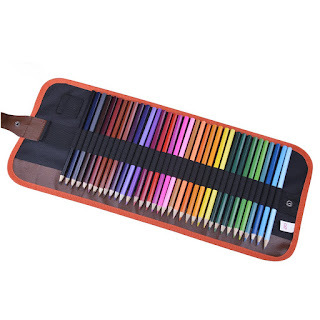 They are beautiful vibrant colors and many shades of each color, and the best feature of all is the awesome carrying case. The carrying case makes it easy to take my "relaxation" with me anywhere I go. The pencils sharpen easily and color as smoothly as a colored pencil can. I really like this set.